HubSpot Review: "Simple, powerful marketing automation for small and medium businesses"
We purchased HubSpot to assist with graduate program marketing. It makes our communications team more agile, giving us the ability create emails and webpages without assistance from our web team. Though we're underutilizing its marketing automation capabilities—e.g., executing campaigns based on visitors' activity on our website—its email workflow has saved a lot of time and guaranteed faster responses to prospects. The UI is great—very easy to learn and use! Data refreshes quickly, setting apart HubSpot from other similar software I’ve used. Add-ons and tie-ins to Google Ads, Facebook Ads, etc. are simple and powerful. HubSpot is overly dependent on lists for marketing automation. Managing so many lists in the system has become unwieldy and messy. There aren’t enough organizational tools within HubSpot, so it becomes challenging to navigate after only a few months of use. Integration with other tools isn’t always easy, so it may be preferred for organizations that want to use HubSpot for everything: marketing automation, CRM, etc. HubSpot makes it easy to collaborate in small teams, but may be overly simplistic for large organizations. Similarly, the challenges I encountered while attempting to integrate with other systems make me think that its sweet spot is small and medium businesses. I expect that companies with complex product lines would also be limited by HubSpot. User Review: "Hubspot is a joy for inbound marketers"
HubSpot is used to manage all sales and marketing operations. 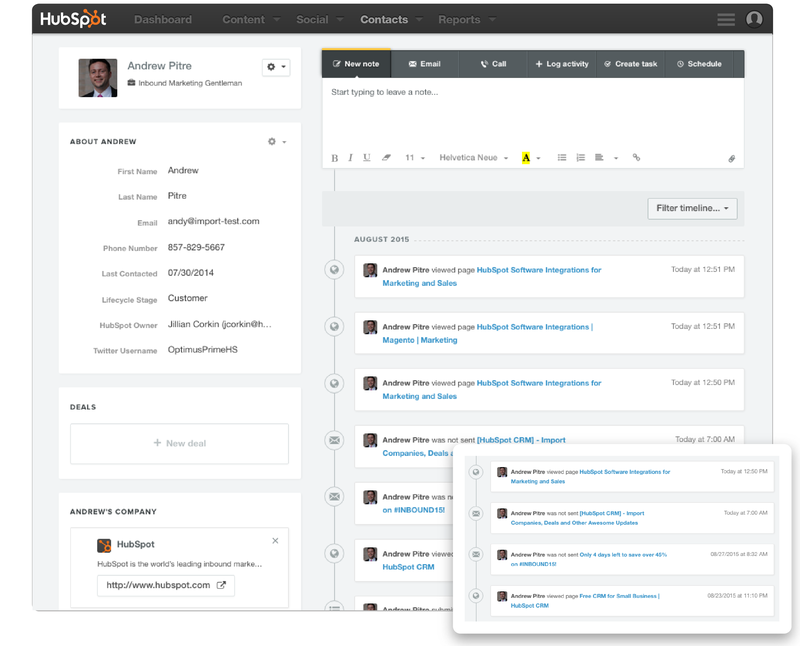 We use the HubSpot CRM to manage sales contacts and push through deals. We also deploy the marketing tools to manage workflows, send marketing emails, create forms and manage content. It has helped us to improve productivity, upgrade our marketing processes and clean our database. It is easy to implement and manage workflows. HubSpot provides clear and comprehensive email marketing reporting. You can use cross-object data to create lists of contacts (e.g. show me contacts who work at companies based in Poland). I find it confusing and difficult to set up sales reports. You can't merge deals together in the CRM. It's expensive and they break up features into add-ons... the costs add up. HubSpot is well suited to a company that relies on digital marketing and is looking to automate their processes. It provides all of the tools you need in one place and they are easy to use and well-integrated. However, it's less appropriate for a sales-focused organization because the CRM lacks advanced functionality. Review: "HubSpot for Sales and Marketing team - everything in one place!" We use HubSpot in our agency to manage all of our Sales & Marketing activities. HubSpot is a great way to align teams so that everyone has a clear view on the data we have available on prospects and customers. This means we can create strategies and content with a clear understanding of what is resonating with our contacts and customers. HubSpot provides centralised management of contact information and insights for the whole business to access, in a very user-friendly way. HubSpot delivers a solid set of tools both for the Sales and Marketing teams, along with some of the best training and support in the market to drive value from these tools and processes. We have a great relationship with the team at HubSpot as well as the ecosystem of supporting vendors and customers. There are numerous groups and educational resources to support HubSpot and learn about inbound marketing. HubSpot has grown the number of tools it offers so keeping pace with these can take some effort, but you don't have to do everything at one! Start with the basics and see some great results. HubSpot is great for businesses seeking to accelerate growth and require an easy way to manage data, marketing and sales in one place. However, some versions of HubSpot may be too expensive for a start-up, so there are packages such as free and basic to support them. The key to getting value from HubSpot as the technology platform is understanding the value of an inbound marketing and sales approach. This may mean you need to pivot some of your processes to become more buyer-focused, which will deliver you a greater business benefit in any case! HubSpot Review: "A Single Solution for Marketing-Sales Alignment that Delivers"
We initially looked at HubSpot as a replacement for Marketo, which was no longer serving the needs of our Marketing team to generate new leads at the pace we needed to keep growing the business. Among HubSpot, we evaluated Eloqua, Oracle Marketing Cloud, and Pardot. Throughout the trial we pursued with HubSpot, we also checked in with our analyst community (Gartner, Forrester) and our end users. Overall, we experienced HubSpot as an intuitive, all-inclusive marketing automation platform that was easy to navigate, with robust reporting capabilities (through an add-on) and a tool that could grow with us as the needs of our business demanded. One-stop platform for our marketing needs: email, social media, video, paid, and organic search. Robust reporting capabilities with an ability to generate custom reporting through a paid upgrade. Additional tools for the business development and sales team to align with marketing and streamline prospecting. As we don't use HubSpot's CRM, some of the data mapping to Salesforce is still lacking. However, HubSpot's dedicated support team is extremely helpful with providing solutions and we have a direct line to the product team, which is working our suggestions into its roadmap. Initially, HubSpot did not support multi-currency. As an enterprise-level customer, this was essential to our deal tracking, as we conduct business throughout the world. At this year's Inbound, multi-currency capabilities were announced, and we're very excited. HubSpot currently does not sync multiple deal flows. This makes reporting out of HubSpot for our sales executives difficult and means that we do not have a single source of reporting and have to rely on both SFDC and HubSpot. HubSpot is an excellent marketing automation platform for multiple business levels. From SMBs who need the support of a free CRM to emerging companies with a marketing team of 1, HubSpot's intuitive CX means a small learning curve and tons of resources to get your team up and running in no time. For those of us in enterprise-level companies, the added comfort of dedicated support far outweighs those the competition offers with creative solution solvers and a team that advises us of best practices to stay competitive. Review: "Always Impressed by HubSpot and its progressive changes"
Our organization uses HubSpot's platform to not only manage our own website, its traffic, leads and contacts, but also our clients. It allows us to easily keep all of the website's goals as well as email marketing, content offers, and social media distribution in one central location. As an inbound marketing agency, the CRM helps us in achieving the goals our clients want and showing exactly how we progress towards them. HubSpot's WYSIWYG interface makes it easy for those who aren't web experts to edit content and modules on website pages/landing pages/blogs without assistance. 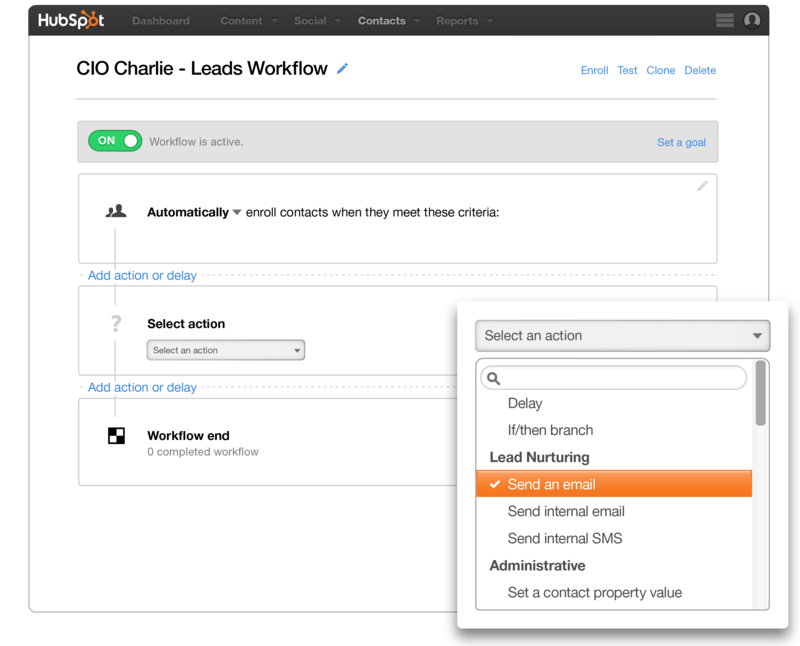 The workflow tool allows HubSpot's users to make powerful automation sequences that would otherwise take people forever to complete or manage manually. Their analytics allow you to get a comprehensive overview of how your website, CTAs Blog, and LPs are preforming, how close you are to hitting your goals, and tips that will help you reach them if you fall short. Would like to see the ability to make more customized RSS email templates, the current set up is a bit restricting. Would like to see some further integrations with tools such as Hotjar so people can better monitor user behavior within the platform and track it. Would like to see some more flexibility for editing specific blog pages if there is custom functionality people want to use. Currently the only workaround for this is to put it into the template that's across all blogs pages, which can be difficult to work with at times. HubSpot is well suited for medium sized organizations who are really trying to push their awareness across the web and are looking for one tool that has the ability to do it all. While the price might be a bit high, the value businesses will get out of it will help compensate for the cost. Review: "There is no going back, once you HubSpot"
We are currently using HubSpot for landing page/site creation, lead capture, and blogging. HubSpot is a great tool that the average person can jump right into by clicking around. The UI is overall intuitive and easy to follow. Support - I've had to call HubSpot support a few times when I began using it. Every single tech support rep I spoke with was great. Whether it was by email or phone, all reps were helpful and clear with instructions on how to fix my problem or simply answer my question clearly. Marketing Library - HubSpot offers so many valuable tools to customers to help them improve marketing efforts and gain more customers. With the combination of the academy, marketing library, support, and the app itself, any business owner can effortlessly improve their marketing plan, business, sales, and more. Training and Consulting (one time fee) - I went through this and felt like it was not necessary for us. Most of the consultations seemed to revolve around how to generate keywords to get organic traffic. Our specific business isn't driven by organic leads/traffic so the rep/consultants seemed a bit confused and weren't very sure of what to do or say.. I think this should be optional for new HubSpotters. Maybe it is now? I am not sure. Auto-Responders - Yeah, auto-responders are great.. however not when you are on the other end sometimes. I had to contact sales over something and was put into an auto-responder loop that went on for a bit without a real response given to me. After I expressed my frustration, my initial questions were addressed properly. HubSpot is beneficial for all companies, however the cost is not great for smaller companies who are just beginning. Those are the companies that need it the most. We use HubSpot for our own marketing management and automation, as well as for our clients. It's absolutely the best CRM out there - in-depth analytics, easy management, great user experience. This tool is super comprehensive and will allow you and your team to set up and follow entire campaigns, create content, monitor and engage, even assign tasks and manage the projects. It covers CRM, marketing, and sales - all of it united and interconnected. It made it easy for our team to work together, streamline our efforts, helped in lead generation and nurturing all the way to the customer stage. Clear-analytics - their dashboards are amazing. You can clearly track lead generation sources, and actions your subscribers took after they converted. Did they keep reading your content? Checked the pricing page? Clicked on CTA? Lead scoring - you can assign each action a specific number of points and make sure that your sales team gets SQLs interested in your product/service. Lead scoring and nurturing through HubSpot will help you position yourself as a source of value rather than a seller. Email Marketing - Easy and simple campaign building, automation, tracking, and analyzing. Leadflows - easy optin solution for your site that's integrated with your campaigns. And at no additional cost! Landing Pages could be better. Changing/designing them is not very easy if you're not willing to purchase already made templates. Having functionality to build pages easily, like you can in LeadPages or ClickFunnels would bring Hubspot's game to a whole new level. Blogging - feature to import blog posts straight from a document (like Google Drive) would save us hours of work! Hubspot is perfect for almost anyone. Email marketing, lead generation and nurturing, content creation - blogging, social media etc., engagement with your audience, analytics are just a part of the awesome features Hubspot has that all businesses need. There might be variations on how you'll actually use it, but when it comes to marketing software this is the ultimate winner. Now, if you're a small business, HS is probably too expensive for you and will not show ROI you're hoping for. I recommend starting with another, smaller and cheaper CRM! Review: "Absolutely LOVE HubSpot - great usability!" We currently use HubSpot for our marketing campaigns, social media publishing and email tracking. We are also currently integrating the HubSpot tracking metric with our CRM database to use lead scoring for not only new customers, but also for our existing accounts. HubSpot is also the host for our website and we have integrated an additional Shopify site domain for tracking and campaign workflow purposes. Great for marketers who want to host a website in an easily edited platform. Also great for web-based content offering and automation. New sales tools are great for sales/ marketing integration and alignment! Review: "HubSpot Is More Efficient & Effective For Online Lead Generation"
The integrated platform is critical for efficiency - everything in one place is a major time-saver. The contacts database is well-designed and easy to use. The HubSpot Websites Platform has made huge progress in just a few short years. Website personalization is the single biggest unique differentiator of the HubSpot COS. It's important to understand where you're currently spending time and money, and what the return is on that investment. HubSpot looks pricey at first, but it has so many tools in one place and unifies the user experience - it makes it much easier for the same people to manage multiple segments of your online marketing efforts, and even to tie offline work into online activity. HubSpot Review: "Easy to Use"
The marketing department uses HubSpot to manage most marketing activities and campaigns. [It's well suited] for anyone who wants an easy to use all in one marketing automation tool. User Review: "Hubspot is the way to go"
We use HubSpot for the marketing department and also our blogs and landing pages. We also use it to schedule meeting and assign tasks to different people in the company. For any company looking to see their marketing and sales go up, HubSpot is the place for you. 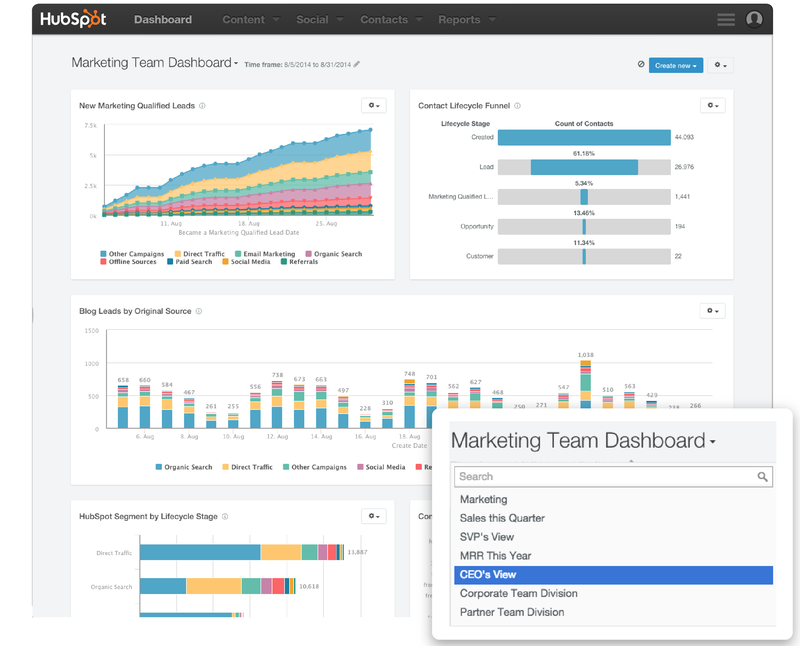 HubSpot Review: "A complete suite of marketing automation tools"
Our sales and marketing departments use HubSpot's suite of tools - namely for our website and blog, as well as marketing automation (email automation). HubSpot is great because we can integrate our website and blog with our landing pages, website forms, CTAs, and the entirety of our lead generation efforts. HubSpot is unique in this way because hardly any marketing automation vendors offer all of these things into one solution. We really needed to upgrade the platform our website was built on, and choosing HubSpot was a no-brainer because of their complete toolset. HubSpot's pricing model is friendly to small businesses, so you aren't charged based on number of users but instead based on number of contacts in the system. As your org grows, you can grow with HubSpot. HubSpot's website and blog tool is easy to use, but also very customizable for those who have more CSS/HTML experience. HubSpot has great marketing and sales related training resources - not necessarily particular to their software, but around the concepts of marketing in general which is really helpful. HubSpot isn't as customizable as some of the other major CRM solutions out there, but in terms of marketing automation they do just fine. Reporting is limited - you can pay for a reporting add-on and there are standard dashboards available, but it isn't much. HubSpot is great for small to mid-sized organizations just getting into marketing automation. It is easy to learn so the ramp-up time isn't very long. I would not recommend HubSpot for extremely large companies with highly complex and customized marketing automation processes. But in most cases, HubSpot is great for SMBs because their out-of-the-box features provide everything you'd need to get started with marketing. User Review: "HubSpot Takes the Cake!" We use HubSpot across our Marketing Department to manage our blogs, landing pages, conversions, email lists, social media, and more. It has been a great way to keep all our information in one space that allows multiple people access. It's been great for collaboration and allowing multiple people in our small department to handle multiple things across the platform. Its social publishing makes it super easy to schedule a ton of posts and see reporting on it, all in one place. HubSpot is well suited for multiple people to work on maintaining email lists, contacts, personas, blogging, landing pages and more. HubSpot Review: "It is improving continuously"
We use HubSpot mainly in the marketing department for email blasts, social media posts and workflows. It basically covers everything we need for marketing and its analytic tools are easy to use and make it easy to generate reports. HubSpot helps us segment contacts easily with smart lists so you can easily target the contacts you want to send emails to. Workflows are easy to set up and run. I like how the campaigns pull everything together in a place for us to review. Smart lists make segmenting contacts easy. Social publishing sometimes doesn't work so well. There's some delays. Sometimes the content just doesn't get posted right away and I have to reschedule it again so it gets published later. It's good for a small business like us. HubSpot Review: "Everything in one place!" Use it for pretty much everything for the whole organisation! Everything is in one place and the menu is easy to navigate so you always know how to find the tools you want. It also allows the business to see deep analytics that help us piece together the buyer's journey really well! Good for organisations of any size. Small companies can make the most of the powerful tools in marketing (in the free version) and when they grow they can move onto paid plans - it is very scalable. User Review: "Another Happy HubSpot User"
We use HubSpot for our own organization's marketing and our clients. By using HubSpot we are able to easily create the landing pages, blogs, emails and social posts that we need to. We also use HubSpot as a way to track our visits, views, clicks, submission and conversions. This tool is very user-friendly and if we ever have a question, the support team is always there to help! HubSpot's support team is second to none! HubSpot does a great job of tracking all of your traffic. This tool has allowed us to show the real importance of inbound marketing through real results! There are some aspects of HubSpot that are not very user friendly.... If there is a coding problem, you are usually on the phone with support to get everything fixed/figured out. Sometimes HubSpot takes a long time to load/do the action that you have just requested. This is mainly for creating large lists and workflows. The salesforce integration is available, but isn't seamless. You are sometimes left doing workflow to workflow to make sure that all of your data matches up. If you are a small marketing team that needs help with reporting, or even showing the value of marketing, HubSpot is the tool to do that! On the other hand, HubSpot does have a large price tag that can turn some people away. They do offer a 30 free trial for you to be able to see results, but it can be difficult to learn a new software and run a trial at the same time and see results. User Review: "So far, so great! Give HubSpot a try!" We're using HubSpot to streamline our inbound marketing efforts - social media, website, email campaigns, etc. The company's digital marketing department primarily uses the software with input from the entire company. We're addressing problems like a clunky web management system, an even clunkier email campaign management system, website responsiveness, and lack of overall contact management/lead scoring. As an update - the entire company is using the HubSpot CRM to track deals, sales activity and more. HubSpot support is great. They're always available (till 8pm EST) and ready to answer the simplest to the most detailed questions. The ability to craft and edit web pages using COS is time-saving. If you want to add a social following section to your site, for example, you simply click ADD MODULE and select SOCIAL FOLLOWING. Pretty cool! HubSpot Academy is a great way to learn anything relevant to HubSpot and/or inbound marketing. They start with the basics and move on up! The INBOUND events in Boston are amazing. Too much to learn in such a short time but love every second of it! Responds to ideas and requests from us - the users. Over the years, hundreds of product enhancements have made HubSpot even better! The "dashboard" is pretty busy, to say the least. Lots of menus and submenus. As a new user, I sometimes feel lost. Making changes to a web page can sometimes be tricky. For example, you might think changing the wording of a menu item would be simple. However you find the wording of the menu item isn't tied to a particular page at all, but a template. You then have to search for the correct template to make edits. For some reason, a lot of the emails HubSpot generates (our leads, the HubSpot blog, etc.) are marked as spam. We had to whitelist all HubSpot IP addresses within our email servers. Update - this is still a huge issue with HubSpot. Sometimes HubSpot thinks bigger than they can swiftly deliver. They're giving all COS clients HTTPS capabilities but it's taking forever to roll out. But still, kudos for engineering and onboarding this! Reports adds on should really be free. Our client wants these basic reports that are supposed to be free but aren't. User Review: "HubSpot GSD "gets s.... done""
We use Hubspot as our content management system for our website, our CRM and also for all the inbound marketing processes. We moved across almost exactly 12 months ago and got rid of all the PAIN(!) of WordPress, themes, CRM, mail tools and an endless selection of third party tools - all of which we were trying to integrate to do just what HubSpot already did - and a thousand times better! We now use HubSpot for everything - albeit we are still only just scratching the surface of its capabilities. I just love it and my stress levels have gone down hugely. (Even though I have a strong technical background, the prior two years we tried to get a website working with a developer and failed - we junked the whole thing and got up-and-working on HubSpot in just a few weeks). The other thing that's great about HubSpot is that there are so many skilled and talented people who work in the HubSpot community, so getting excellent help at very affordable cost is now so easy. Any small organisation - who wants to look like they have a "big organisation" budget can really benefit. In learning how to use HubSpot, you also learn how to "do" inbound marketing. The support is fast, knowledgeable and enthusiastic so you never get stuck. Content loading is a cinch. And the templates make it easy for everyone to keep to a consistent look and feel. Emails are easy to set up and send to your list. Ease of use - even non technical people can load content and use the HubSpot tools - it's so easy to onboard new people to using HubSpot. It has the wonderful quality of being both easy to start with and then rich enough to keep you going. Honestly - its so much better than all the "stuff" I was using previously - at the moment I can't think of a "con". Every business can use Hubspot. HubSpot Review: "Give it a go - you won't regret it!!" We use HubSpot for all of our CRM needs, website development, content marketing, e-mail marketing, analytics, and lead generation. HubSpot is quite quickly becoming a bit part of our day to day activities. Our sales team is using the CRM more consistently and constantly and relying on the information within it more and our marketing team is starting to create more marketing campaigns through the marketing side to help assist the sales team and also boost brand awareness and measure different campaign outputs. CRM - the capabilities within the CRM, (which is free) are amazing, especially considering that it is free. We were paying for a different CRM software, and it didn't have half the capabilities that HubSpot's CRM has. Clean looking, and easy to use, the uptake from the sales team to use it was super quick and there haven't been any complaints about it. Reporting - essential to our board members and upper management, the reporting add on is great and gives you a great overview of the business. Marketing - integration with the CRM means there is no loss of information between the two products. Creating campaigns is easy and can give you some great results and insight into what works and what doesn't work. CRM & Reporting - there is no multi-currency currently which makes it hard as we operate over several countries. CRM - currently no parent-child accounts which makes it hard to manage partner channel sales. HubSpot is suited to all types of businesses - it isn't limited to any one industry. In all scenarios it will help you manage your customers, see what they are after, track conversations and make sure they are looked after well! The marketing platform again helps you advertise to all types of businesses through different social media platforms which means it is applicable in all scenarios. HubSpot Review: "Awesome software – all-in-one marketing platform – credit where it's due!" We use HubSpot for ourselves and our clients. The marketing platform, along with the CRM and analytics package enable us to take a deeper look at our contacts (all lifecycle stages) and make more intelligent, insightful decisions about our marketing activity. The all-in-one system offered us the best package for our strategic company goals. We had none of this in place prior to HubSpot and certainly not the level of analytics available now. We use all the functionality available to us and HubSpot does everything we need. The certifications have been extremely welcomed by the team and have become almost an internal competition to grow internal knowledge and skill sets. Majority of the team are Inbound certified (even the receptionist!) and now over half the team have 3-6 certifications in total. The agency itself own all 10 certifications at present. HubSpot also ensures all our departments are aligned, especially marketing and sales and all the new product developments are set to take this to a whole new, exciting level. HubSpot culture is awesome! The team are passionate, part of your business and love the brand. This makes the partnership 110% The culture and community draw you in and make you feel part of something bigger. Blogging platform is important for us and our clients. 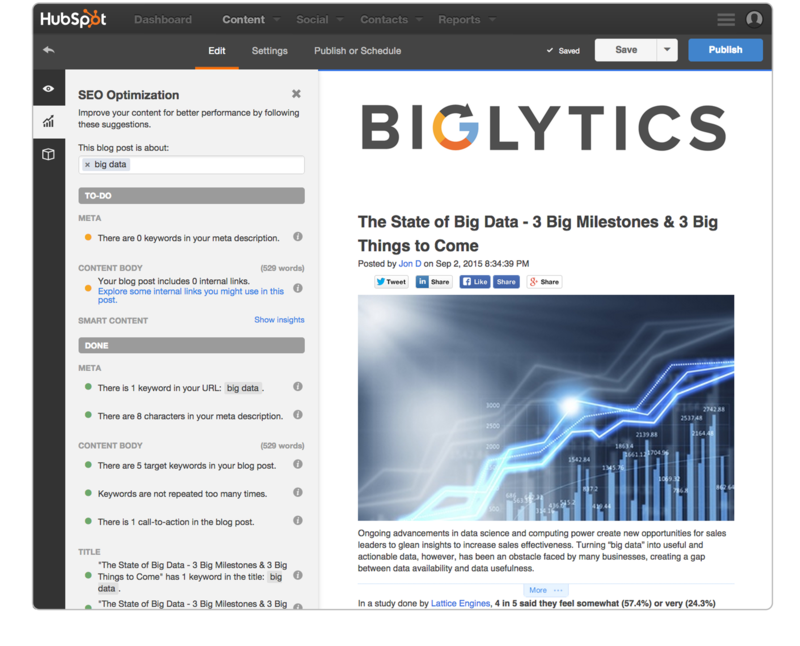 HubSpot makes it easy to draft, edit, publish and measure blogs. It is also simple to create and both CTAs and SEO are a built-in functionality. The reporting has room for improvement but currently delivers what we need. We are a digital marketing agency and HubSpot is a key function in what we deliver. It offers marketing automation, behavioural marketing, contextual marketing capabilities and caters for end-to-end, marketing through to sales enablement. Review: "Why I love HubSpot and why you should love it also." I used Hubspot in the agency where I worked for 7 years. Currently I am an independent consulting entrepreneur and I only use the free version of both products, marketing and CRM. Even being limited versions, they are quite useful. I have hubspot connected to my web in WordPress through a plugin and the great thing is that, thanks to collected forms, I can follow up on any conversion that takes place on my website. These contacts become part of my database on the platform, but at the same time I use it to redirect contacts to MailChimp, which I use for shipping and automation. Additional use the tool "Lead Flows" and recently added the "forms" to that version. What I like most is the monitoring of a user's life cycle according to their behavior. Content management - it facilitates the creation of any piece of content. From a post to social networks, a blog post, a mailing or Landing Page. Contact management - because it allows for a total tracking of each user from reaching away until it becomes a client. Also it helps to monitor the life cycle of each contact and creating smart for debugging database lists. Keyword management - I love completely handling the keywords of HubSpot because it helps you to do research, it helps you track and in each publication helps you with optimizing contents. The forms - with smart fields [you can] avoid asking the same information from frequent contacts and this helps us limit our database with additional information about each person. Keywords suggestions only work in English and short tail keywords. I recommend using HubSpot for big brands with long purchase cycles. I do not recommend it for retail or massive consumption brands or SME enterprises with low budget. Yes, they could use some inbound tactics, which could be implemented seamlessly with other tools. HubSpot is to go all the way, with each phase of the inbound methodology. User Review: "HubSpot MVP in Marketing"
HubSpot is an integral part of our Marketing team, and is used for everything from lead generation, blogging, e-mail marketing, and social media management. If you send out e-mails as a regular part of your organization's marketing and/or sales strategy, then HubSpot will be a key asset in realizing more measurable results. Review: "HubSpot - All-in-one marketing platform"
We use HubSpot as a marketing automation platform across our marketing department. On any given day, we probably have 10 - 15 people using various parts of the software. We use it for email, lead nurturing, lead scoring, persona segmentation, analytics and reporting, paid ads reporting, blogs, landing pages, CTA, A/B testing for small things like email and CTAs, keyword research, and more. We have HubSpot integrated with our other main tools in marketing including Brightcove, Salesforce, and WordPress as our CMS. HubSpot is an excellent comprehensive marketing automation platform for a small to medium-sized company. The email capabilities in HubSpot are simple to use and they offer good analytics and list capabilities. The reporting capabilities for HubSpot are some of the easiest we have. We use Google Analytics and a few other tools like Mixpanel, CrazyEgg, and SFDC, but HubSpot reports are very intuitive. The forms software was a little limited if you don't do custom CSS work, but I believe this has improved. We are now able to produce good-looking landing pages and forms. Some of the HubSpot emails are not as mobile-responsive as I would like them to be, but this could be user-error on our part. HubSpot used to have limited integrations but they are adding to those every month and now all of our major technologies we use integrate well. I think HubSpot works well for small- to medium-sized businesses. It has a comprehensive set of tools that can run much of the sales and marketing automation that is needed for this size of business. I'm not as familiar with Marketo, Eloqua, and Pardot and other marketing automation platforms, but I like the value I get out from HubSpot. I also like all of the implementation partners that HubSpot works with who have been able to come in and help us with our marketing. User Review: "HubSpotting in the wild"
It's no exaggeration to say that HubSpot entirely changed how our digital marketing agency works and what we can offer to our clients as a result. For a few short months we offered the CRM and Sales package as optional extras to our package but now it is rare that we will work with somebody who is not willing to use it, the difference in business acceleration it provides is just too big to ignore. You can make your sales people more efficient, your marketing automation smarter and your website personalised in more than just the basic terms of including somebody's name in a title. HubSpot Professional is suited to small to medium businesses looking to accelerate their business growth. It's especially useful for businesses just at that tipping point of getting too much business to manage on spreadsheets and word documents any more. If your team is growing it will help you to get more out of your existing people and slot new members in to the team with minimal training. HubSpot Review: "Not just for Marketing"
Probably too many to mention here, however, Hubspot has helped us to measure marketing in a way that we hadn't been able to do previously. It has helped us measure the effectiveness of emails, web pages, landing pages and our keyword strategy. It has also helped the sales team by automating key tasks and also allocating leads more effectively than Salesforce could on its own. This has brought the marketing and sales teams closer together and improved both collaboration and alignment across the two teams. We have also extended its use to help our customer service teams with the distribution of key customer emails such as welcome packs. And our IT team is now looking into how it can be extended to help other departments and increase automation across the business. The breadth of functionality and how this functionality can be applied to departments outside marketing to help streamline processes and increase automation of time-consuming, yet mundane tasks. Being able to have our team all working within the same piece of software, improves collaboration and increases efficiencies. The level and flexibility of support is also outstanding with a number of huge knowledge bases and online technical support who can answer your questions first time almost all the time. Innovation - the amount and frequency of new functionality that is added and that is useful and easy to use. The workflows have been much improved, but there are still some limitations to their size, which can lead to linking workflows to other workflows and not being able to loop in order to end a workflow. The reporting add-on is not intuitive and takes a long time to get to grips with. 99% of time Hubspot's functionality meets our business needs. Which, in a way, makes the 1% when it doesn't even more frustrating! The biggest thing with Hubspot is its ability to be extended outside of the marketing department to help automate other departments' repetitive tasks. As mentioned earlier, Hubspot has helped us to measure marketing in a way that we hadn't been able to do previously. It has helped us measure the effectiveness of emails, web pages, landing pages and our keyword strategy. Social is probably the one weakness, in terms of its functionality when compared to other specialists in this sector, however, Hubspot's record for continually improving its product offering is exceptional, so it wouldn't surprise if that was the next piece to see significant improvement. HubSpot is an all-in-one inbound marketing engine that includes tools for email marketing, landing page creation, social media marketing, content management, reporting & analytics, search engine optimization (SEO) and more. The vendor says over 18,000 customers in more than 90 countries use HubSpot’s all-in-one marketing & sales software platform to transform the way they connect with new customers. Online Marketing capabilities to ensure that content can be found through search engines, social networks, email, blogs, etc. HubSpot's marketing platform integrates with popular CRM systems like Salesforce, or can be used with the free HubSpot CRM for a true all-in-one experience. The vendor says this results in less hassle, more control, and an inbound strategy that actually works. HubSpot aims to help businesses leave behind dated approaches to driving business growth in favor of an inbound approach - attracting new visitors, converting them as leads, closing them as customers, and delighting them over the long term. HubSpot Blogging and SEO - HubSpot provides an integrated set of tools for Search Engine Optimization (SEO) which makes getting found online a natural part of your inbound marketing mix. More than a simple CMS, HubSpot provides an integrated authoring view with SEO-oriented suggestions as you write blog posts.HubSpot Contacts - Integrating with most common CRMs, HubSpot provides a seamless view of your contacts, allowing you to customize and personalize email communications.HubSpot Analytics - Track engagement with your entire funnel with real-time reporting on website performance, traffic and marketing effectiveness.Marketing Automation with HubSpot - Define workflows for highly targeted and personalized nurturing campaigns that send your leads and prospects the right targeted content at the right point in their decision-making process.HubSpot Social Media - Don’t batch and blast. 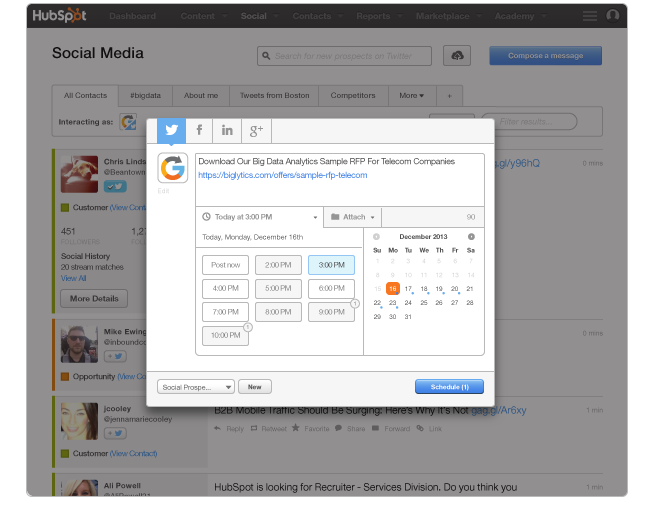 HubSpot’s social media publishing helps you become smarter about the way you schedule and publish content on social media.